This isn't just the second to last dialogue exchange in “Mission: Impossible: Fallout”; it's also a summary of the preceding two and a half hours. If ever there was a typical “Mission: Impossible” movie—the template of which was forged nearly a quarter century ago—this is it. “Fallout,” much like “Rogue Nation” before it, seems determined to stay completely inside the lines set and maintained by its fellow “Mission” brethren, as well as other spy-action movies. In fact, of “Rogue Nation,” I had written: “...the movie left me feeling cautious and uncertain about future 'M:I' installments...Cruise and the filmmakers seem willing to water down and re-use the plots on which the action and stunts hang. I'm not sure how long this approach can go on.” Unfortunately, “Fallout” confirms to me it cannot go on any longer, or at least it shouldn't (I'm sure the movie will still be a huge financial success), and it's the first “Mission” movie I can't justifiably recommend. It tears me up inside to write such words, because as a series of technical exercises and highly elaborate stunt sequences, “Fallout” is stupendous and exceptional, and often the best of its kind. On paper, its ambitions as a spy thriller, at least as far as spectacle, should have yielded quite the mesmerizing movie-going experience. But oddly enough, as a movie doesn't feel experiential. It plays as more of a model that future second unit directors, stunt coordinators, and editors might study in order learn how to seamlessly execute action sequences of the highest caliber and complexity. From an academic point of view, I would recommend it hands down, but from a narrative one, I needed more than just the standard “Mission” plot to engage me. Speaking of the plot, if the film's closing dialogue summed it up as “the usual,” then the opening scene, in not so explicit of words, essentially promises the same thing. 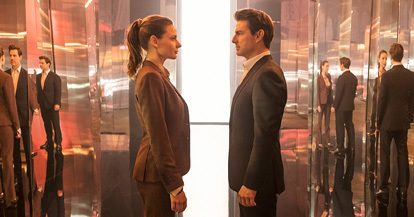 During the trademark, “This is your mission, should you choose to accept it” encrypted recording, spy/agent Ethan Hunt (Tom Cruise) receives word that members of the terrorist organization known as the Syndicate, led by the now-captured but still very dangerous Solomon Lane (Sean Harris) and which Hunt sought to prove the existence of in “Rogue Nation,” have recently resurfaced and formed a new faction called The Apostles. They are partnering with a faceless zealot named John Lark, who has written a manifesto that outlines a fanatical plan to wipe the Earth clean of corruption and sin in order to begin it anew. It's your typical megalomaniacal scheme, which will begin with Lark contaminating enough of the world's water supply to eliminate one-third of the planet's population.